I’m back with another five things on Friday! This time, I thought I’d share some unusual crafts that I’d love to try, and I thought you might, too. 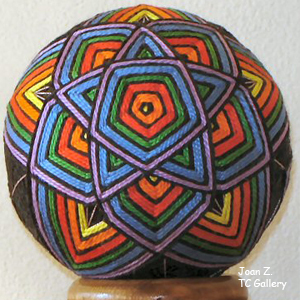 Temari are Japanese thread balls. That is, they are balls that are both wrapped with thread and yarn and then embroidered. The craft apparently started in China and was taken up in Japan about 500 years ago. It’s an old craft, but you can still find resources for making these pieces online. Try Japanese Temari or Temari.com. 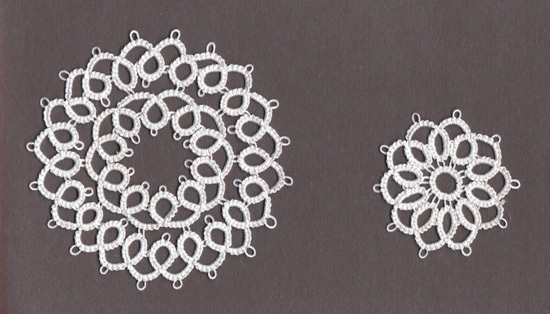 Tatting is another old craft, dating from the early nineteenth century. It’s a way of making lace that’s somewhere between crocheting and macrame. You can do it with a special tool called a shuttle, or you can do it with specially-designed crochet needles. I already have a book and DVD and can’t wait to start trying it out. You could make cool patterns to adorn pillows, towels, or even make jewelry out of it. Check out In Tatters for more info and tutorials. I’ve already got some books on this one, too. 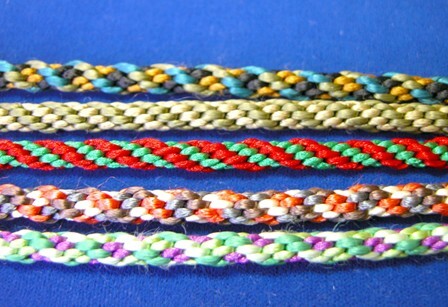 Kumihimo is the art of Japanese braiding (the Japanese sure do have a lot of cool crafts!). All you need is a braiding disk, which you can make out of cardboard. Slits around the outside hold the strings in place, and then you simply move strings from one slit to another in myriad different patterns to make different kinds of braids. Check here for a simple introductory tutorial. Did you try batik when you were in school? I definitely remember doing it in art in about the 8th grade. 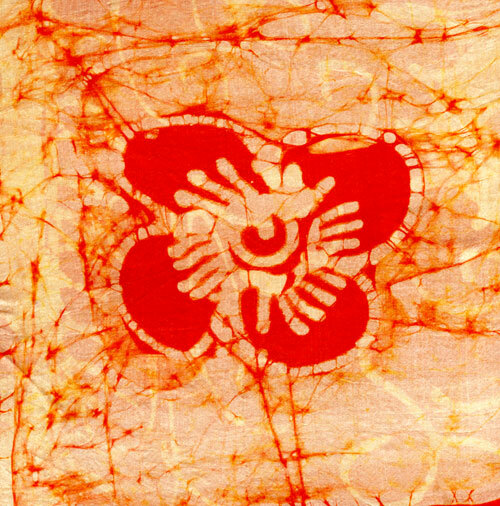 Batik is a form of resist fabric dyeing that comes from the Far East, particularly Indonesia. You use melted wax to create a pattern on fabric, and then when you dye the piece, wherever there’s wax, the fabric won’t take the dye. One of the fun parts of batiking is putting a bunch of wax on, letting it dry, and then krinkling it up. Then, wherever the wax was “bent,” you get a bit of dye seeping through. That’s how those spidery lines were achieved in the above photo. Check out Craftster or this batik workshop. My mom used to do chicken scratch embroidery, back in the day when she was all crafty herself. It’s kind of a down home, American craft that feels very retro. It apparently started in early America, moving across the country with settlers. 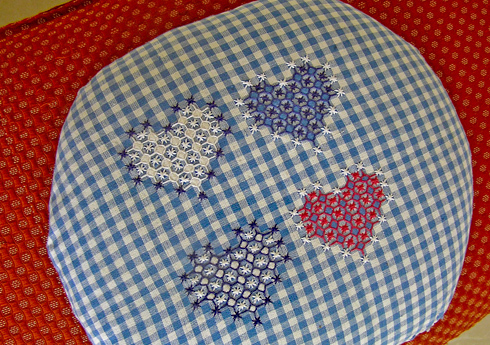 Essentially, you do cross stitch on gingham, since the squares are provided for you already. And with different sizes of gingham, you get a different look. I have an old pattern book from my mom that I’d love to try out. Maybe some Christmas ornaments? For a tutorial, check out Pink Paper Peppermints. So, that’s what’s on the horizon for me. Have you done any of these crafts? Do you have other skills you want to master? Let me know in the comments! I’m loving the Kumihimo, but having a hard time envisioning how it works from the tutorial sheet. Also, the chicken scratch demo is quite charming! Damn thee for giving me ideas of what to do with my time (I’m trying to be more disciplined about writing, and this will tempt me)!! Those ARE some obscure crafts. I’m surprised to have never heard of chicken scratch. I love cross stitch though, looks fun. When I saw the first one was an odd Japanese ball, I thought it was going to be that thing where you roll up and polish a big ball of dirt. Have you seen this? OK, I had not heard of this dirt ball thing, but I Googled it. Dorodango. I don’t get how it gets so shiny, but… wow. Now I might have to try that, too. Schoolchildren do it, apparently, so how hard could it be?